In my teens you could not miss it. Every wall with graffiti, every cool T-shirt, just about all wrapping-paper for school books had an image by Keith Haring. Back then I was not really enamoured by the very recognizable style with its abstracted faceless figures in bright colours. That is until recently, when during a lecture about art and transcendence I saw The Life of Christ. The professor used the work to make clear that we need new images to depict old matters like Advent. And this work immediately drew me in. The bronze panels covered with gold leaf remind one of a classical triptych and the brilliance of the gold conjures up the world of icons. One is immediately struck by the movement in the work, up and down, while it is quite impossible to determine where the movement starts or ends. People express their despair, reach up or clench their fists to the sky, as there is so much injustice they do not understand. Their weeping and their tears fill the centre of the work and ascend to heaven. Figures of angels move up and fall down. This makes me think of the song that evokes for me the spirit of Advent, ‘O come, O come Emmanuel.’ That song speaks of lamentation, repression and reaching – discouraged and with a sense of impotence – towards the promised hope. This is what the people at the bottom of the panels do. This image becomes all the more forceful when we realize that Haring made this work two weeks before he died of AIDS and that one of the versions of this triptych hangs in the Interfaith AIDS Memorial Chapel in San Francisco. The song as well as the artwork speak not only of distress and waiting in anguish, but also of hope and love. With the divine figure at the top we see a heart and the Christ Child being embraced and fed. It looks as if the love that is depicted here, the love that is born and becomes human here, it looks as if it descends – descends together with all those divine arms longing to embrace, descends with all the celestial tears which are shed for the seen and heard suffering, descends with the blessing rain he sends, with all those rays of light that flow from him. May we at this time of Advent become quiet and reflect on our own suffering and that of those we see around us, close by and far off. Together with them we may say: ‘Come, Jesus, come.’ May we watch expectantly for the love that became human and wants to embrace us. And, may we also realize that God not only meets us in our pain by becoming human, but also knows our affliction by suffering hardship from within. We not only see symbols of love in this triptych, but we also see the symbols of the cross and the rising sun, the sun of the resurrection, of the new day, of the new creation when all tears will be wiped away. 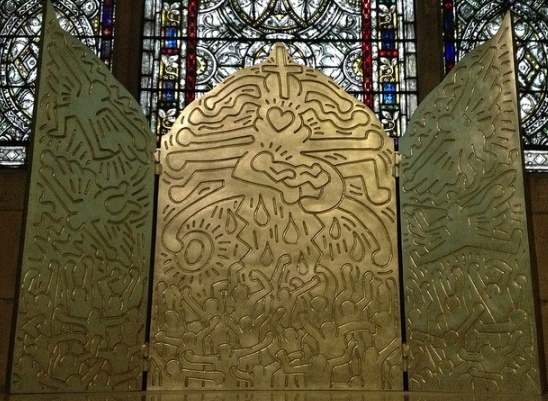 Keith Haring, Altarpiece The Life of Christ, 1990, bronze with white gold leaf patina, 81 x 60 x 2 in. © Keith Haring Foundation. There are at least nine versions of this triptych, cast in bronze and covered in white gold. One is located in the Cathedral of St. John the Divine in New York City. Another is permanently located at the Saint-Eustache Church in Paris near Les Halles in the first arrondissement. Tom De Craene is an archaeologist. He also has a BA in art history. Since his graduation he has been active in the International Fellowship of Evangelical Students (IFES), Ichtus Flanders, since 2007 as its General Secretary. In the coming years he hopes to be able to deepen his knowledge of the relationship between art and theology and sees it as his calling to create space for art and artists inside as well as outside the church.